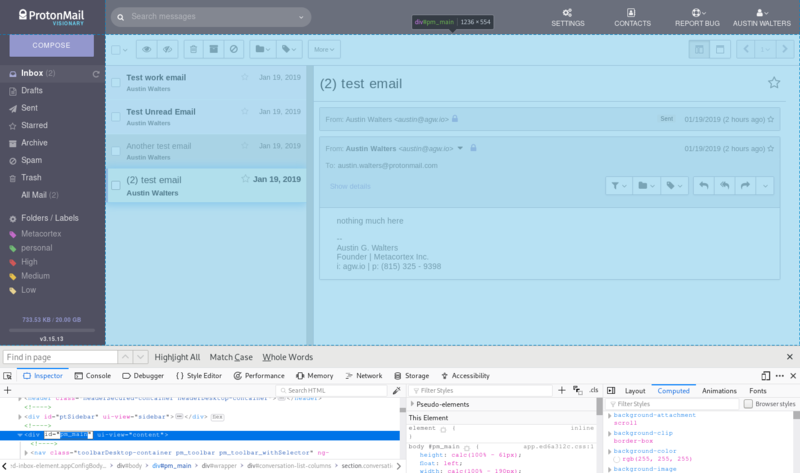 Recently, I switched to ProtonMail as my email provider (they enable encrypted emails) and one of the neat features of ProtonMail is that you access the CSS to setup your own theme. Obviously, I couldn’t help myself! So, I wrote a little CSS to improve my experience and provide this guide as an introduciton. I plan to continue to update the CSS as I find things I’d like to tweak. My github repo will be kept up-to-date. 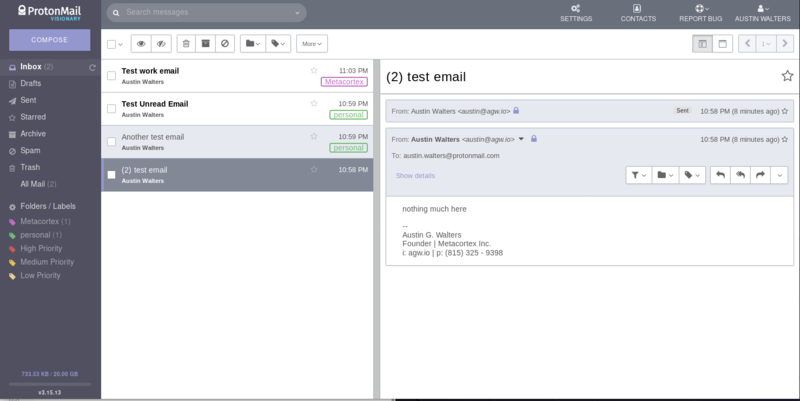 Overall, it looks similar to other email services. Nothing too special or difficult to understand. The conversation(s) column (where you select which email chain you’re interested in) was ~40% of the screen and the conversation itself was only ~60%. I’d much prefer to see my conversation(s). The conversation(s) column goes dark for the selection and is only white or gray. I.e. it doesn’t stand out what I need to do. I email hundreds of emails a day, I need to know what I need to do. Given my major issue was the conversation(s) column, I thought to myself: “This should be an easy fix”. 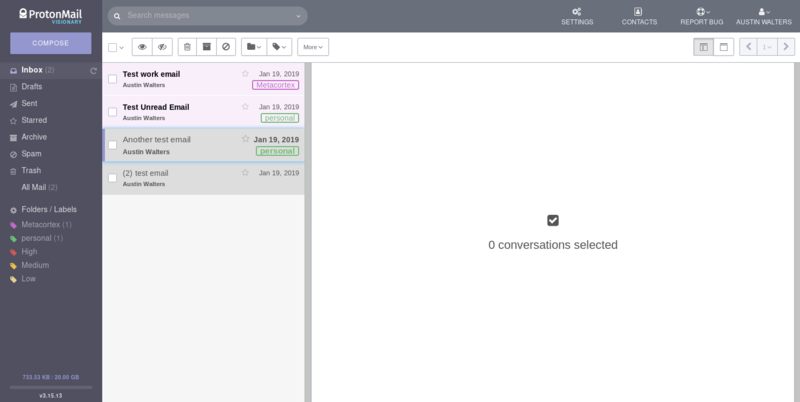 I wasn’t wrong, it was relatively painless, so I’ll tip my hat to the ProtonMail team. I also shrunk the conversation window slightly, so the text wouldn’t line directly up with the side of my browser window. Essentially, I just set the width of each of the elements to ensure the desired viewing frame. The next item I needed to address was the grayness of the conversation(s) tray / column. I send & respond at time, hundreds of emails a day. Having a quick way to work through my inbox is mandatory. With that in mind, I set out building a better highlighting system. It may not be super pretty (and I’m sure I’ll update it), but it gets the job done. 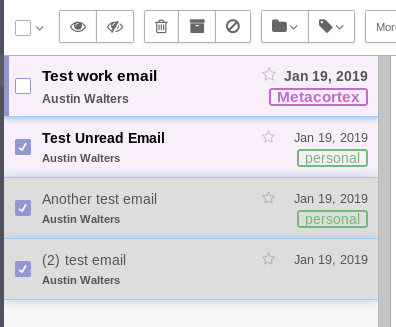 As you can see, the email that is currently “marked” is glowing and the “unread” emails are currently slightly pink. Looks good to me! Exactly what I was looking for. Again, if you’re interested in all the code in one file (or the most up-to-date theme) feel free to checkout my github repo. 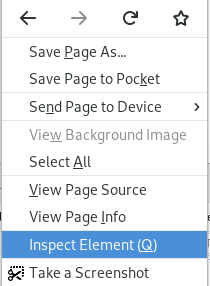 It should be as easy as copying the file out the CSS folder, and putting it into the appearance section under the settings in ProtonMail.